India's Most Wanted teaser: Arjun Kapoor is all set to create a buzz with his upcoming film India's Most Wanted. Recently, the makers of the film revealed the teaser of the film featuring Arjun Kapoor in a lead role. The film is directed, written and produced by Raj Kumar Gupta. The film will hit the silver screens on May 24, 2019. Finally, one of the highly anticipated teaser of Rajkumar Gupta’s directorial is out, featuring Bollywood actor Arjun Kapoor in a lead role. The 90-second teaser is a pack of thriller and chiller visuals and story of a man, played by Arjun Kapoor, who is actually hunting for India’s Osama. After watching the teaser, it can be said that Arjun Kapoor is in his full form. He has carried a thick beard and an urge to reach his target in the film. Sharing on his Twitter handle, the actor revealed that it is a story of a manhunt for India’s most wanted terrorist. He also quoted that it is an operation that included no guns or weapons just the guts and the inner will to achieve something. The teaser provides a small glimpse of a man who plans 52 bomb blasts in several cities of the country and took the lives of approximately 433 people. In the background, a voiceover of the most wanted person is heard quoting that, it is the body which dies not the soul. He further quotes that he is not killing people he is just sending them in new bodies. 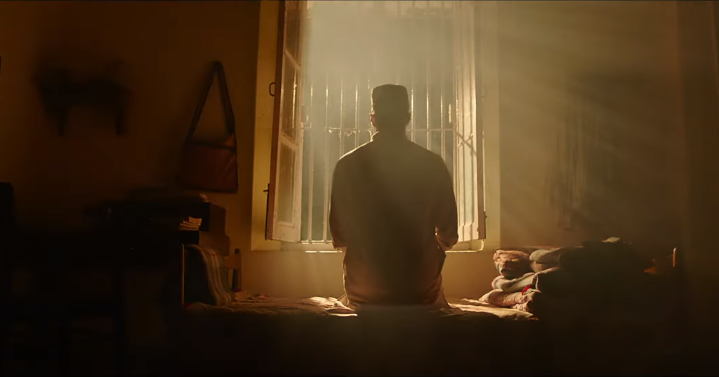 The first visual showcases the most wanted person who is known as India’s Osama in the teaser from his back. He is sitting alone and is briefing about his nature of killing people. The second visual showcases the eyes of the unnamed man. The third visual is of the lead actor Arjun Kapoor who is looking dapper carrying the intense looks in his eyes. His eyes well showcase his guts and inner will to achieve his aim. The film is directed, written and produced by Raj Kumar Gupta, who is best known for films like No One Killed Jessica and Raid. The female-led role is portrayed by Bollywood actor Amrita Puri. The film will hit the silver screens on May 24, 2019.